He's Back! Looking Ahead To TERMINATOR GENISYS | Warped Factor - Words in the Key of Geek. Sometimes you just have to say enough's enough! When a film or idea reaches its limits and sadly becomes nothing more than a cash cow that provides a variation on a theme its time to pull the plug. But we know that the public are suckers for a franchise and it's difficult to ignore another lucrative instalment once you're hooked, even when you apply common sense. When Hollywood gets bored and runs out of ideas it tends to go look through its back catalogue of successes to top up the bank balance and to hopefully finance new original films in the future. You can imagine a rotund executive smoking a cigar, summoning yes men to explore the possibility of squeezing a few more dollars from the public, and getting a resounding affirmative to the idea even if it sounded like absolute and utter tosh. This brings us in to the impending release of 'Terminator Genisys', and let's acknowledge firstly that Hollywood can't spell to save its life and that it doesn't exactly give a hoot or a yeehaw. You'd think with a country apparently stuffed with born again Christians they would have consulted the bible as the oldest form of spellcheck. 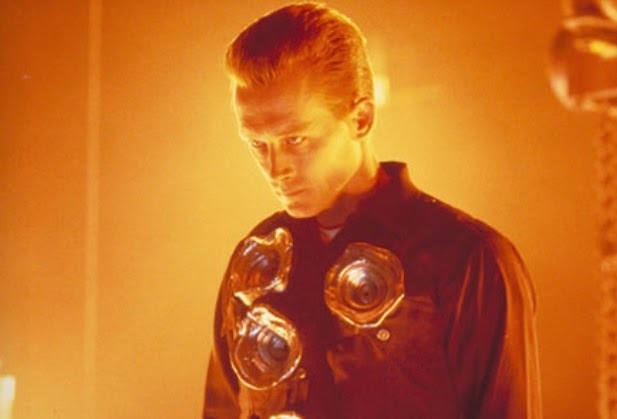 Terminator in its day was a fantastic concept, even if it proved to be a little confusing at times, but it was original and innovative with sublime effects, especially in "Terminator 2" (which co-starred Robert Patrick). And and you knew with that level of success that it would likely trundle on for a few years to come. However at this rate with Arnold Schwarzenegger's advancing years (he's two years shy of being 70), we may have to rethink the name of the franchise, perhaps "The Septuagenarianator" which can then be called " The Octogenarianator" after he turns 80. Schwarzenegger clutching the script for Terminator Genisys, on location in Rotherham. "The way that the character is written, it's a machine underneath. It's this metal skeleton. But above that is human flesh. And the Terminator's flesh ages, just like any other human being's flesh. Maybe not as fast. But it definitely ages." It's a crowd pleasing explanation, but one suspects that Arnie may just provide a cameo role without being important to the film, paving the way for other sequels without him, something we will touch on again later, but if this is the case the script will be key. 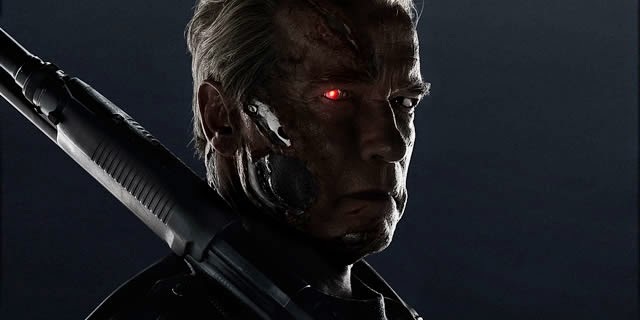 Schwarzenegger didn't exactly hold back on his opinion of Terminator Salvation which he claimed "sucked" and he thanked God that he declined to star in that particular outing, so lets hope he doesn't regret appearing in the latest offering. 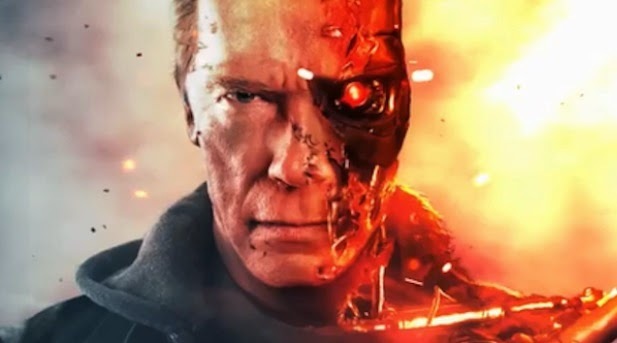 It's said that Terminator Genisys will appeal to followers of the first two films especially, but not much is known regarding its content or style. Rumours are rife, and it has even being muted that the studio has so much faith in this one that two further sequels are merely awaiting old fashioned rubber stamping, but there's more. Although lets be honest, when security is tight whatever isn't known is generally made up or maybe has about five percent of the actual truth, so bare that in mind. It's said that the story has been heavily reworked to allow greater flexibility to create further films which may not please fans of the originals and that time lines are being bent and broken to facilitate this. That there is a twist that will alienate fans to such a degree that it may result in a widespread backlash against the film and the series. This one's looking likely - see the Payoff Trailer! The hybrid of Salvation has apparently been replaced by the new, new hybrid! Which is like buying a car from the local dealers one week only to find there's another better version on the market six months later. It's said that Arnie's contribution may well be as an anchor between old and new and that this will be nothing more than a swansong for the former Californian governor in the lead up to the transfer of power to another much younger actor. Not that Arnie objects to fleeting roles. You'll remember he got a credit along with Bruce Willis in "The Expendables". Neither appeared for more than three or four minutes but were heavily promoted in the advertising and were presumably paid handsomely for a minimal contribution, something which majorly hacks me off. The unwritten fan rule is don't take the public for granted and don't assume they are stupid, yet Hollywood being Hollywood ignores everything in pursuit of the eternal revenue stream . All I can tell you about the plot such as it is, is that Kyle Reese teams up with John Connor's mother Sarah after discovering a new timeline . He joins forces with an aging terminator to prevent "Judgement Day". This basic information hardly gives much away or gets the pulses racing - it's like a mini skirt, just long enough to cover the essentials but not so long that it dents your curiosity. Lets hope that it is not just about the money, that the film has something to say and does not detract from its previous incarnations. If it does fail to deliver the goods then hopefully it won't be back.